For appetisers, the house platter is a greedy way to try a selection of mezes: delicate and creamy sautéed spinach is given a kick with a simple sprinkle of shallots; a shower of tart pomegranate jewels offsets the subtle pungency of tender lamb meat balls; while the seared perfume of roasted eggplant is perfectly paired with sweet streaks of mint and fried-onion flecks. The tomato-based lamb stew snuggles up perfectly against cumin-scented shards of braised okra and a small mountain of saffron-tinged rice. The combination of flavours, colours and textures is still being achieved with flying colours. Beware, it’s tempting to sit here all night and keep ordering. Short of snagging a UN-sponsored trip to Iran, Singaporeans don’t have too many opportunities to dine on Persian food. 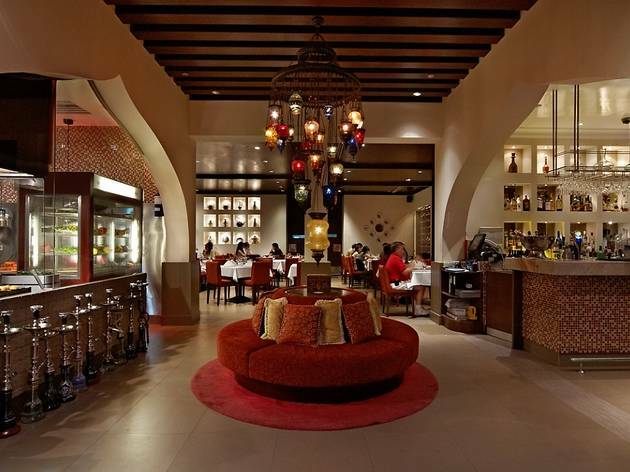 There’s Banoo on Mohamed Sultan Road with its spread of lamb stews studded with chickpeas and dried lime; while Samia Ahad’s inventive Coriander Leaf boasts a chelo kebab (steamed butter rice with sumac-marinated beef) and kubideh (lamb kebab). But it’s Shiraz – named after the ancient Persian city – that has captured the attention of the local Iranian residents with its authentic flavours. 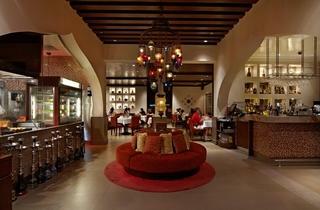 The interiors are subtly accented; the peaked archways and floral tiles are the only giveways about its provenance. Which is a good thing since the food more than stands on its own and diners don’t need to be distracted with over-the-top decorative embellishments that so many local restaurants are fond of. From behind the glass show kitchen, Iranian executive chef Mohd Hussain leverages ingredients such as garlic, onions, cottage cheese, butter and hits of sharp lime, cinnamon and saffron to create a compact but intensely flavoured Iranian menu. For appetisers, the house platter was a happily greedy way to try a selection of mezzes: Delicate creamy sautéed spinach was given a kick with a simple sprinkle of shallots; a shower of tart pomegranate jewels offset the subtle pungency of tender lamb meat balls; while the seared perfume of roasted eggplant was perfectly paired with sweet streaks of mint and fried onions flecks; and the mound of pitta bread was just the thing to indelicately scoop up the yoghurty blend of finely minced lamb and charred eggplant. Hussain doesn’t skimp on the portions as he sends out large crowded plates that could easily be shared. His tomato-based lamb stew was a fist-sized serving snuggling up against cumin-scented shards of braised okra and a small mountain of saffron-tinged rice, while the Caspian Kebab featured huge hunks of grilled Toman fish fillet and snapfresh prawns marinated with mint, and paired with an addictively salty golden brick of crisp rice. The baklava – a small brick of filo, pistachio and gooey honey – provided an intense diabetic jolt and a filling roundoff to the meal; though the discovery of tiramisu on an otherwise vividly Middle-Eastern menu was the sole odd note of the evening. The combination of flavours, colours and textures was flawlessly done, and were the portions not so large, it would have been tempting to sit there all night and keep ordering.